The hills and valleys of North Wales are dotted with holy wells, many of which were in use as places of spiritual healing long before the coming of Christianity. Ffynnon Eidda, or Eidda’s Well, lies high up on the B4407, a windswept but spectacular moorland road between Ysbyty Ifan and Ffestiniog. 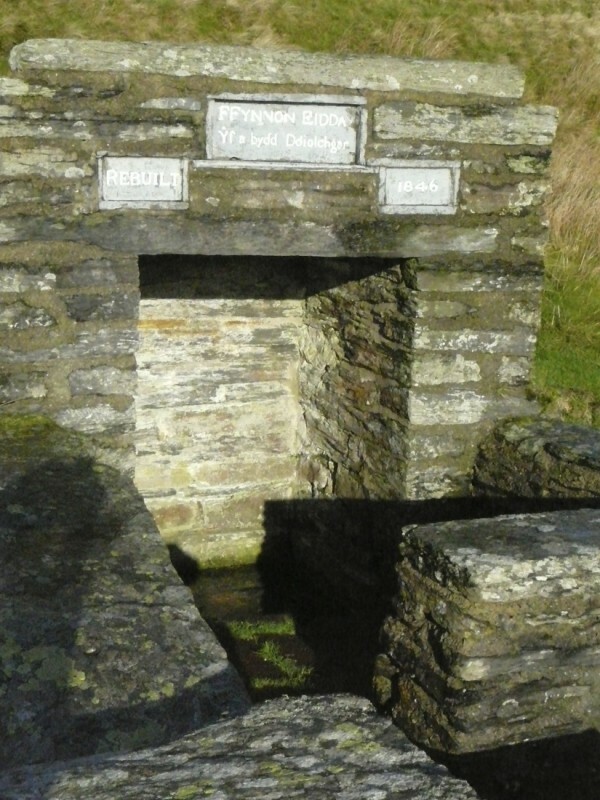 A low stone enclosure surrounds the spring, bearing the inscription ‘Ffynnon Eidda – Yf a bu ddiolchgar’ (‘Drink and be thankful’) and the words ‘Rebuilt 1846’. In the 18th and 19th centuries Ffynnon Eidda was a stopping place for cattle drovers who were herding large numbers of animals to markets as far away as London’s Smithfield. The cattle would be allowed to drink here before being moved on down towards Pentrefoelas and eastwards along what is now the A5. …Ffynnon Eidda, which was once considered virtuous (or beneficial) and effective in treating and curing illnesses. The well is strongly overflowing at all times with clear and tasty water, and the good stone enclosure was built when the Estate was in the possession of Lord Mostyn. But the well has much earlier origins: Eidda was probably an early saint from the same era as St Columba and St Brendan who travelled from Ireland to western Britain in the 6th century; The name also occurs in Cwm Eidda, a nearby valley. Ffynnon Eidda is only ten minutes’ drive from where we used to live, in Penmachno; it lies at an altitude of 485 metres (1,590 feet), and the twisting single track road up Cwm Hafod yr Edwydd was often icebound in winter when there was no trace of snow or ice at home. On a good day, there are wonderful views southwards towards the mountain of Arenig Fawr, and westwards across the Migneint moors to the valleys that lead down to Porthmadog and the Llyn Peninsula. You might, if you’re lucky, glimpse a hen harrier, a merlin or a red grouse. We found this by mistake what a fantastic find the view is beautiful and to find something so old great . Glad you found it, John, and yes, what a fabulous but windswept location! I remember it well! It’s lovely to think of the drovers and their herds passing by there.